Seven years ago, we launched Techlicious. It was to be a place for regular people, not just techies, to learn about new technologies, get buying advice, troubleshoot tech problems and pick up tips on how to get more out of the tech products they own. At that time, most of these types of stories could only be found on sites written for tech enthusiasts. We set out to create content that was easy for people that weren’t tech-minded to understand. Fast forward to today, and we are still working to fulfill those needs, curating our stories to the focus on information that’s the most helpful and relevant to our audience. The challenge, which every entrepreneur faces, is to keep innovating. Every day we think about how to grow, what we should try next and what we should be doing to keep our articles and videos fresh and available on the platforms where our audience wants to consume them. So I was intrigued when Capital One invited me to virtually attend a panel they were putting on at the Outside the Box festival in Boston entitled “Reimagining Perspectives: Identifying Gaps that Revolutionize Industries.” In recognition of the passion and innovation that’s essential to growing businesses, Capital One brought together Feng Chang, Director of Digital Marking Strategy at Rue La La; Dave McLaughlin, General Manager at WeWork; Wombi Rose, Founder of Lovepop Cards; Pat Petitti, Co-Founder and Co-CEO of HourlyNerd; and Capital One’s own Jim Kresge, Head of Digital Commerce Engineering in a panel designed to inspire entrepreneurs reimagine their own businesses. 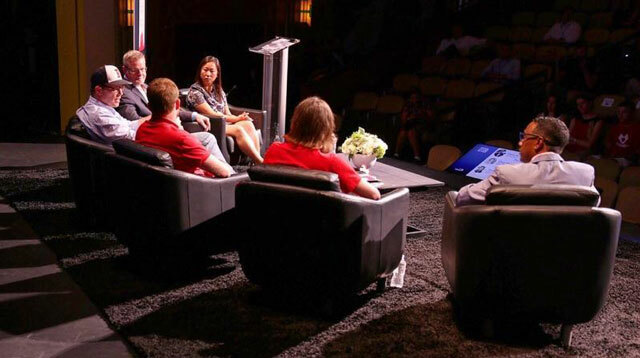 From the left: Feng Chang, Director of Digital Marking Strategy at Rue La La; Jim Kresge, Head of Digital Commerce Engineering at Capital One; Dave McLaughlin, General Manager at WeWork; Pat Petitti, Co-Founder and Co-CEO of HourlyNerd; Wombi Rose, Founder of Lovepop Cards; and the host, Mario Armstrong, Host of NeverSettle.TV & NBC TODAY Show Contributor. When you look at the industries represented by this group of panelists—greeting cards, e-commerce, financial services, staffing and real estate—they seem pretty staid. And yet, each company has found a way to change the way we think about and engage with their sector. So what were my key takeaways from these successful, entrepreneurially-minded panelists? Want to get your own dose of inspiration? Watch the enlightening panel discussion here on ForaTV. This is a sponsored conversation written by Techlicious on behalf of Capital One.